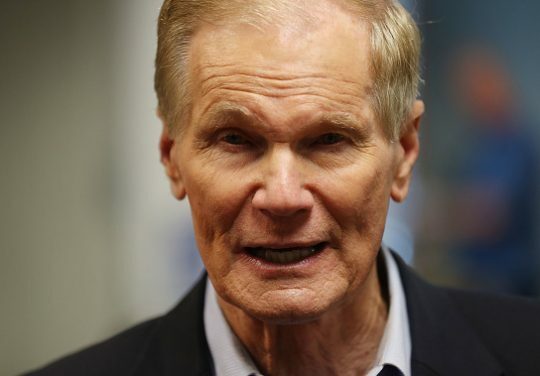 Federal officials sent a letter Tuesday refuting Sen. Bill Nelson (D., Fla.) claim that the Russian government is still compromising Florida's election infrastrucure. Earlier this month, Nelson made a shocking claim that Russians were still interfering in the U.S. electoral system and had compromised voting systems in his state. "They have already penetrated certain counties in the state and they now have free rein to move about," Nelson said. "The threat is real and elections officials — at all levels — need to address the vulnerabilities." Secretary of Homeland Security Kirstjen Nielsen and FBI Director Christopher Wray sent a letter to Ken Detzner, the Florida secretary of state, that shot down Nelson's claims. Their letter states they "have not seen new or ongoing compromises of state or local election infrastructure in Florida." "We have now received their response, which continues to offer no evidence or information to corroborate Senator Nelson’s claims," Detzner's office stated. A Nelson spokesman released a statement responding to Nielson and Wray's letter. When Nelson initially made his claim, the Florida Department of State said there was no evidence to back it up. "Additionally, the department has received no information from the U.S. Department of Homeland Security, the Federal Bureau of Investigation or the Florida Department of Law Enforcement that corroborates Sen. Nelson's statement and we have no evidence to support these claims," the department said in a statement. "If Sen. Nelson has specific information about threats to our elections, he should share it with election officials in Florida." The Washington Post Fact Checker subsequently gave Nelson "Four Pinocchios," its highest level for a falsehood, for the claim. The Post noted there is not "a single speck of evidence" to back up the claim that "Russia currently has access to Florida’s election systems and could purge voters from the rolls." U.S. intelligence and homeland security officials have cautioned that election systems may be threatened in the upcoming midterm elections. Since Russia's interference in the 2016 election, election security has led to increased scrutiny, congressional investigations, and Robert Mueller’s special counsel probe. No information has been released that a single vote was changed in 2016 or that Russia actively tampered with any voting systems. This entry was posted in Politics and tagged Bill Nelson, Election, Florida. Bookmark the permalink.